The demand for tattoo removal services grows every year, and the Palomar SINON laser machine can help you meet that growing need. This Q-switched Ruby laser system features a 694 nm wavelength for the ability to remove virtually all tattoos, no matter the color or complexity. And most importantly, it can remove tattoos and pigmented lesions without causing damage to the surrounding skin. The Palomar SINON laser system has become a top seller because of its speed at removing tattoos, often in just a few treatment sessions. This model delivers one of the shortest pulses of any system with the highest peak power for impressive results. 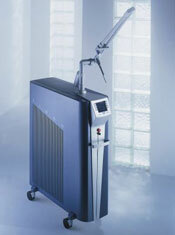 Contact SunrayLaser.com today if you are looking for the lowest price on a pre-owned Palomar SINON laser machine. In addition to removing tattoos, the Palomar SINON is effective at treating Cafe-au-lait-spots, benign lentigo and Nevus of Ota. SunrayLaser.com has used Palomar SINON laser machines for sale at a cost that is as much as 60% off the original retail price, and we provide a full satisfaction guarantee for your peace of mind. At SunrayLaser.com, we professionally test and inspect every piece of cosmetic laser equipment we sell. That means if a system does not meet or exceed the original manufacturer’s specifications, we simply will not offer it for sale. If you are interested in this model and would like a fast price quote with no obligation, contact us right now.